Entirely at ease in all situations and with any style, the Overseas black dial model comes in two versions: an understated self-winding three-hand watch, and a chronograph. 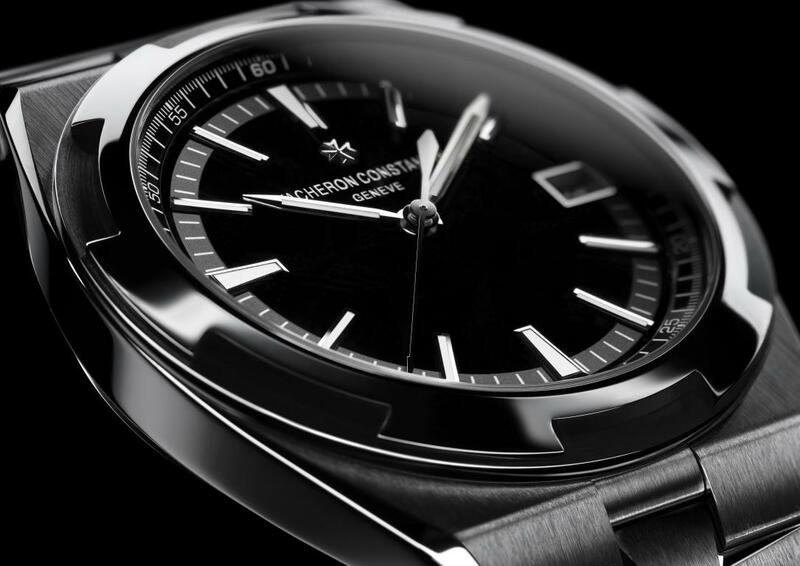 For the latter, VacheronConstantin has focused on legibility by choosing a silver-toned colour for its three additional counters. 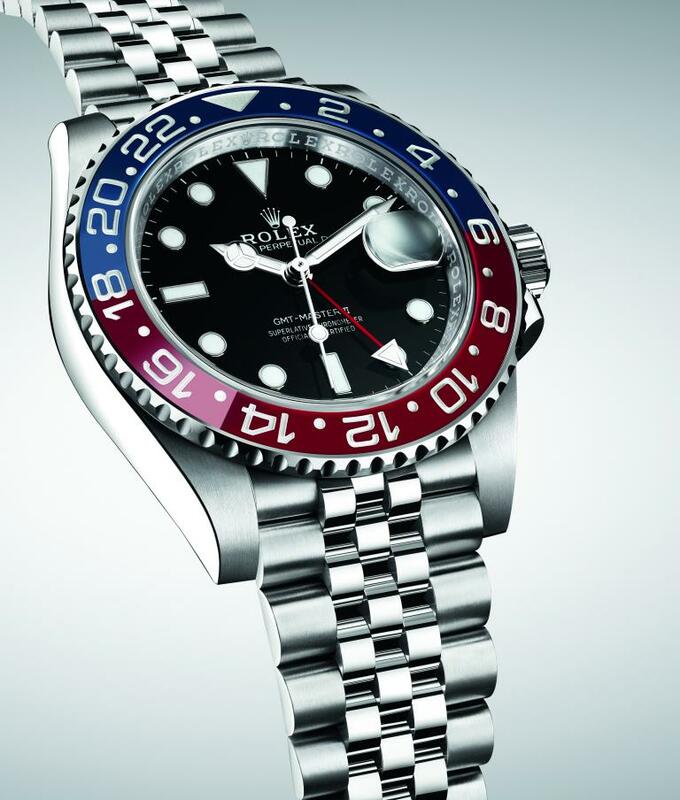 Rolex is extending its GMT-Master II range with a new version in Oystersteel, equipped with a bi – directional rotatable bezel and a 24-hour graduated two-colourCerachrom insert in red and blue ceramic. The lugs and sides of its Oyster case have been redesigned, and the watch is fitted on a five-link Jubilee bracelet. Two other versions of the GMT-Master II introduce 18 ctEverose gold to the range for the very first time. The first is crafted entirely from this refined, exclusive alloy, and the second is avail – able in an EveroseRolesor version, combining Oystersteel and 18 ctEverose gold. On the dials of both watches, the name “GMT-Master II” is inscribed in powdered rose. The bezels are fitted with two-colourCerachrom inserts in a black and newly developed brown ceramic. These new versions are equipped with the new-generation calibre 3285, at the forefront of watchmaking technology. With 10 patent appli – cations filed over the course of its development, the movement is equipped with a Chronergy escapement and guarantees a power reserve of approximately 70 hours. Since 2005, Rolex has played a pioneering role in the development of special ceramics for monobloc bezels and bezel inserts. These new materials are exceptionally resistant to scratches and corrosion, and offer particularly intense colours that are un – affected by ultraviolet rays. 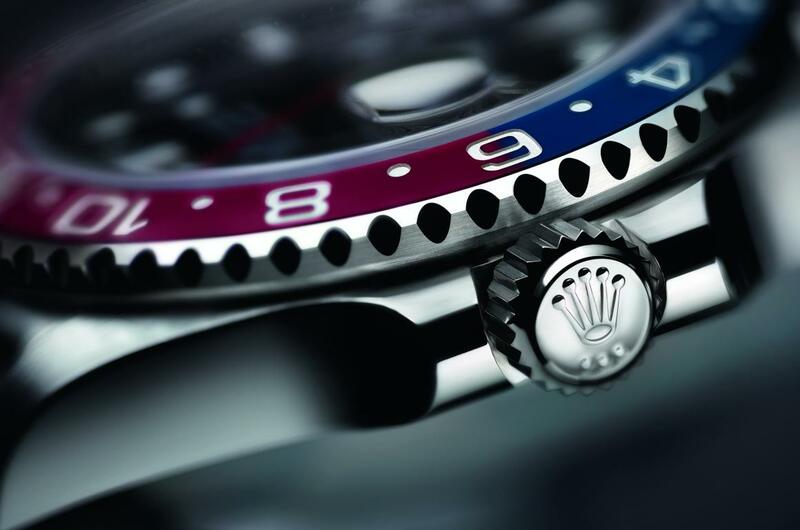 Rolex made full use of its expertise in developing the high-technology production methods that allow it to manufacture its ceramic components independently in-house. 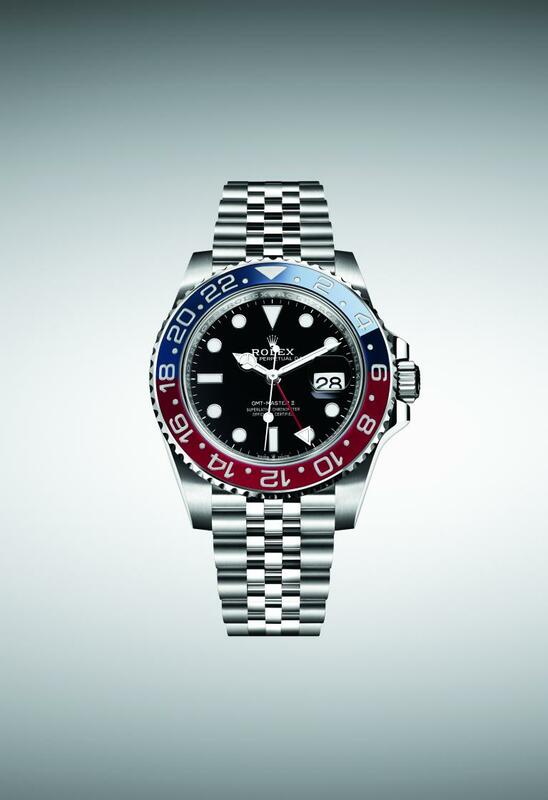 Rolex is able to create these ceramics in single colours as well as two-colour versions. The Cerachrom insert in red and blue ceramic is the most iconic of these, as it calls to mind the colours chosen for the first GMT-Master, launched in 1955. For nine years, the exceptional qualities that characterize Harry Winston have been embodied in a singular tourbillon watch. Histoire de Tourbillon 9—the latest from a long lineage of timepieces—casts a new light on fine watchmaking innovation. Its triaxial tourbillon has been augmented with retrograde jumping hours and retrograde minutes. Once again, the Histoire de Tourbillon collection pushes the boundaries of cinematic magic attained by a tourbillon. Histoire de Tourbillon 9 sees this complication perform a new ballet, choreographed by the pure expertise of Harry Winston. Nestling in a well of light, the triaxial tourbillon takes up every possible position on the sphere, in turn creating an infinite number of possible positions for the escapement. Hence time is measured with uniquely exquisite delicacy. It is rendered visible by two hands. Both the minute hand and the hour hand are retrograde, while the latter is jumping. True to the highly mechanical and skeletonized style of Harry Winston’s grand complications, Histoire de Tourbillon 9 plays with volume, symmetry, and transparency, following principles of design that break with convention. With a diameter of 46.5 mm, Histoire de Tourbillon 9 is the most compact watch in the Histoire de Tourbillon series. With steeply curved lugs that follow the natural contours of the wrist, the Histoire de Tourbillon 9 is pleasantly comfortable to wear. Additionally, the case band – which is the opaque element – is relatively slim and features a high domed sapphire crystal known as a glass “box” that bulges over it. Histoire de Tourbillon 9 uses layers of transparency to create an artistic effect. 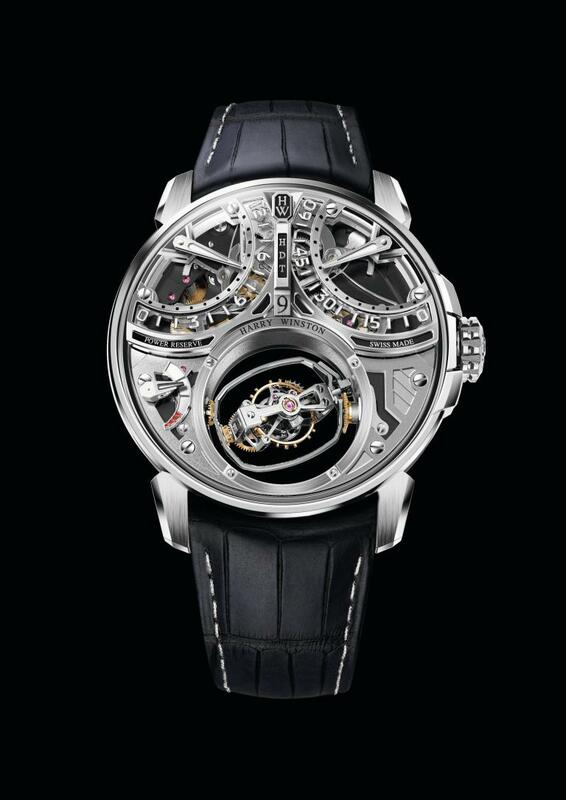 The tourbillon holding the three carriages undertakes its rotation in a well of light measuring 20.5 mm in diameter. On the back side of the case, a second glass box sits against the wrist. It incorporates a dome, which melts into the thickness of the wrist and gives the tourbillon all the space it needs to freely complete its triaxial rotation. Through an openwork dial, the hour and minute hands circle directly above the movement and point to two zones calibrated with Arabic numerals. The power-reserve indicator at 8 o’clock displays a field and a two-part hand that share a distinctly three-dimensional nature. On the bottom side is an entirely open worked and satin-finished barrel bridge. 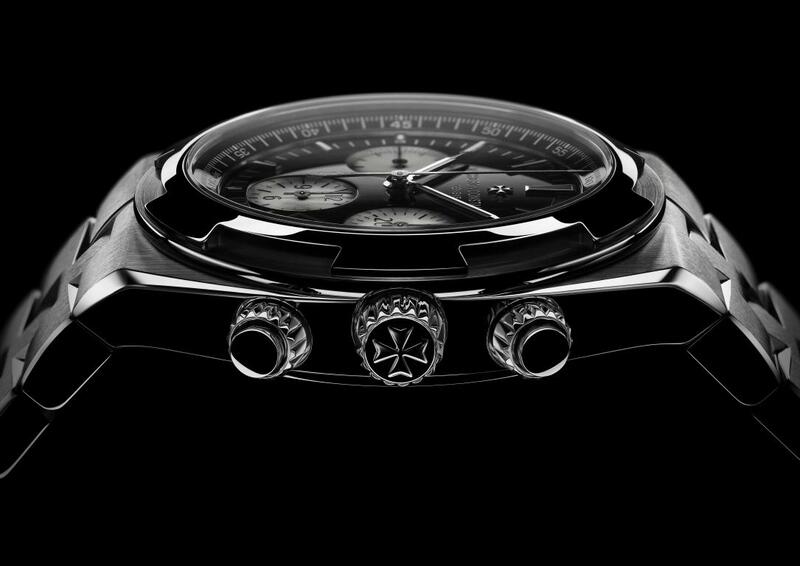 It structures the whole underside of the timepiece, further set off by a surface treatment that enhances the effect. 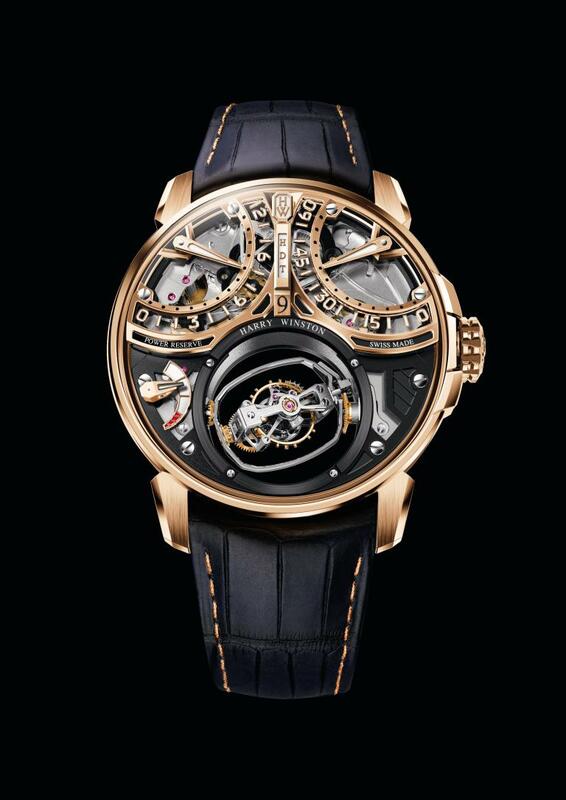 The Histoire de Tourbillon 9’s two poweraccumulating organs are daisy-chained beneath the barrel bridge. However, the main element is still the triaxial tourbillon itself. The first carriage— the biggest—holds the other two, and takes 300 seconds to rotate on its axis. It encloses an intermediate carriage, which spins in 75 seconds. The third, and smallest, carriage directly holds the large variable-inertia balance wheel and completes its rotation in 45 seconds. An ambassador of Harry Winston’s watchmaking expertise, Histoire de Tourbillon 9 is the quintessential embodiment of the brand’s spirit. The power of this timepiece lies within the shape of the triaxial tourbillon’s external carriage. Another aesthetic hallmark – the three arches that cover and encircle the crown on Histoire de Tourbillon 9 – was inspired by the entrance of Harry Winston’s iconic Fifth Avenue Salon in New York City.